Make any plastic object you want! Just heat the beads using hot water or a hot air blower to transform the beads into a pliable putty. 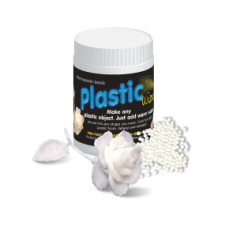 Mould into any shape you like then allow to cool to a rigid plastic shape. Not happy with the shape? Simply reheat and reshape! Non-toxic • Reusable • Bio-degradable. CAUTION Only remove from water when comfortable to handle! Cools to a hard, white plastic finish that can be painted. Final plastic can be filed, sanded and even drilled! Not happy with the shape? Simply reheat using hot water or a hot air blower and reshape the plastic! Ask about our plastic tint dyes to create coloured plastic. Scolding Hazard. Handle carefully. Do not swallow beads. Keep out of reach of small children. Small plastic objects could present a choking hazard.